Are wrinkles just an expected effect of ageing, or could they signal something more threatening? The latest ESC Update is that Deep forehead wrinkles harbinger of cardiovascular mortality. Therefore according to researchers assessing brow wrinkles could be an easy, low-cost way to identify people in a high-risk category for CVD. According to research presented at the ESC Congress 2018, people who have lots of deep forehead wrinkles, more than is typical for their age, may have a higher risk of dying of cardiovascular disease (CVD). The study participants were followed for 20 years, during which time 233 died of various causes. Of these, 15.2% had score two and three wrinkles. 6.6% had score one wrinkles and 2.1% had no wrinkles.The study participants were followed for 20 years, during which time 233 died of various causes. Of these, 15.2% had score two and three wrinkles. 6.6% had score one wrinkles and 2.1% had no wrinkles. According to the study authors, previous research has analysed different visible signs of ageing to see if they can presage cardiovascular disease. 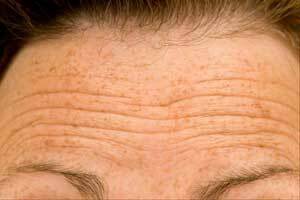 In prior studies, crow’s feet showed no relationship with cardiovascular risk but these tiny wrinkles near the eyes are a consequence not just of age but also of facial movement. A link has been detected between male-pattern baldness, earlobe creases, xanthelasma (pockets of cholesterol under the skin) and a higher risk of heart disease, but not with an increased risk of actually dying (2). The researchers don’t yet know the reason for the relationship, which persisted even when factors like job strain were taken into account, but theorises that it could have to do with atherosclerosis, or hardening of the arteries due to plaque build-up. Atherosclerosis is a major contributor to heart attacks and other cardiovascular events. “Forehead wrinkles may be a marker of atherosclerosis,” says Dr Esquirol.